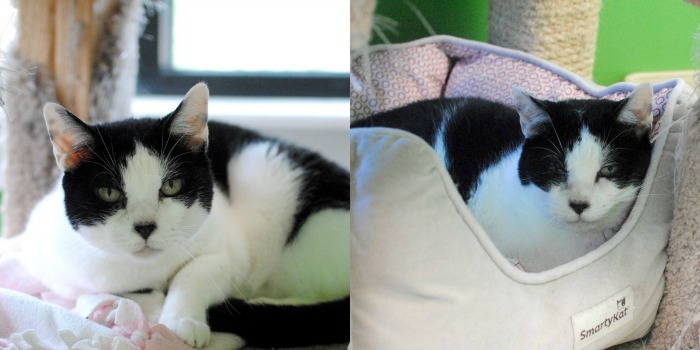 Lucy and Linus are a sweet pair of cats that are hoping someone will give them a chance a happy new life. They came to Good Mews several years ago and after being at the shelter a couple of years, someone adopted them. They lived a quiet life, then when their guardian was moving out of state, she felt it best not to bring them along. When they came back to Good Mews, they were very upset because their peaceful life was turned upside down. At first, they would run or hiss when you tried to touch them, but once they settled in, they got so much better! Lucy is a lot more confident than her brother and loves being petted. She will stand up, and turn circles, making sure you pet every inch of her. She loves attention and doesn’t seem to get enough of it. But she only allows pets; she’s not a fan of being picked up and will run if you try. Linus took more time to adjust and you still have to go very slow with him if you want to pet him. He is very cautious around people and he really does prefer the company of cats rather than people. He loves his sister and they are often seen cuddling up together, napping. He also likes some of the other cats in the shelter and is good buddies with Dunkin, another shy boy. Everyone says they have a “bromance” going on. Lucy and Linus are going to need a patient adopter that will be willing to give them time to adjust to a new environment. Having them just live in a home is not enough for them. Lucy loves attention, but Linus will need to learn to trust and it could take some time. But they are wonderful cats and deserve a loving home. Lucy and Linus are bonded are must be adopted together! If up for three cats, Dunkin would love to come along! Linus and Lucy are bonded and must be adopted together.